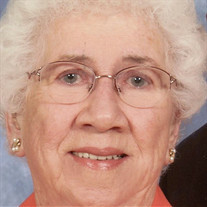 Glenna Louise (Hanlin) Streets, age 87, of Baltimore, MD and formerly of Petersburg, WV passed away on Sunday, May 6, 2018. She was born June 30, 1930 in Mt. Storm, West Virginia and was a daughter of the late Warner H. Hanlin and Freda J. (Likens) Hanlin. In addition to her parents, she was preceded in death by her husband of 62 years, Henry Bruce Streets on January 29, 2017; five sisters, Margurite Aronhalt George, Pauline Reedy, Floe Jean Carter, Betty Cosner and Laura Shreve; five brothers, Elmer Hanlin, Kenneth Hanlin, Garland Hanlin, Ernest Hanlin and Lester Hanlin. Mrs. Streets was a member of the Locust Grove Church of the Brethren on Bismark Road, Mt. Storm, WV. Mrs. Streets is survived by her son and daughter-in-law, James D. (Shirley) Streets of Baltimore, MD; two granddaughters, Jessica L. Streets Ziegenhein and Valerie N. Streets, two great granddaughters, Jamie and Jordan Ziegenhein; step great granddaughter, Jessie Ziegenhein and two sisters, Leona Dawson of Cabins, WV and Evelyn Bosley of Martinsburg, WV. A Funeral service will be held on Thursday, May 10, 2018 at 1:00 p.m. at the Schaeffer Funeral Home with the Rev. John E. Walker officiating. Family will receive friends one hour prior to services. Interment will be on Friday, May 11, 2018 at 11 a.m. at the Holly Hill Memorial Gardens, 10201 Bird River Road, Baltimore, MD 21220.